You've invested valuable time and money researching the habitat requirements of the fish and corals you wish to house. Naturally, you want to protect this investment by executing a proper acclimation process once the specimens arrive at your door. The purpose of acclimation is simple: the water that the fish or corals are packaged in has different temperature, pH, and salinity parameters than your aquarium. 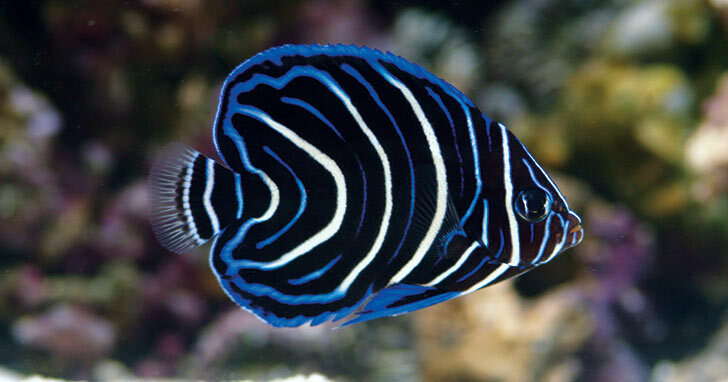 Fish, and especially invertebrates (including corals), are very sensitive to even minor changes in these parameters, so proper acclimation is the key to ensuring their successful relocation. Dim the lights in the room where the shipping box will be opened. Never open the box in bright light - severe stress or trauma may result from sudden exposure to bright light. Float the sealed bag in the aquarium for 15 minutes (Fig. A). Never open the shipping bag at this time. This step allows the water in the shipping bag to adjust slowly to the temperature in the aquarium, while maintaining a high level of dissolved oxygen. After floating the sealed shipping bag for 15 minutes, cut open the bag just under the metal clip (Fig. B) and roll the top edge of the bag down one inch to create an air pocket within the lip of the bag. This will enable the bag to float on the surface of the water (Fig. C). For heavy pieces of live coral that will submerge the shipping bag, place the bag containing the coral in a plastic bowl or specimen container. Add 1/2 cup of aquarium water to the shipping bag (Fig. D). Repeat step 5 every four minutes until the shipping bag is full. Lift the shipping bag from the aquarium and discard half the water from the bag (Fig. E). Float the shipping bag in the aquarium again and proceed to add 1/2 cup of aquarium water to the shipping bag every four minutes until the bag is full. Net aquatic life from the shipping bag and release into the aquarium (Fig. F). Remove the filled shipping bag from the aquarium and discard the water. Never release shipping water directly into the aquarium. Start with Steps 1-3 of the floating method to acclimate water temperature. Carefully empty the contents of the bags (including the water) into the buckets (Fig. G), making sure not to expose sensitive invertebrates to the air. Depending on the amount of water in each bag, this may require tilting the bucket at a 45 degree angle to make sure the animals are fully submerged (Fig. H). You may need a prop or wedge to help hold the bucket in this position until there is enough liquid in the bucket to put it back to a level position. Using airline tubing, set up and run a siphon drip line from the main aquarium to each bucket. You’ll need separate airline tubing for each bucket used. Tie several loose knots in the airline tubing, or use a plastic or other non-metal airline control valve, (Fig. I), to regulate flow from the aquarium. It is also a good idea to secure the airline tubing in place with an airline holder. The Doctors Foster and Smith Acclimation Kit is a convenient alternative that simplifies the drip acclimation process. Begin a siphon by sucking on the end of the airline tubing you'll be placing into each of the buckets. When water begins flowing through the tubing, adjust the drip (by tightening one of the knots or adjusting the control valve) to a rate of about 2-4 drips per second (Fig. J). When the water volume in the bucket doubles, discard half and begin the drip again until the volume doubles once more – about one hour. At this point, the specimens can be transferred to the aquarium. Sponges, clams, and gorgonias should never be directly exposed to air. Gently scoop them out of the drip bucket with the specimen bag, making sure they’re fully covered in water. Submerge the bag underwater in the aquarium and gently remove the specimen from the bag. Next, seal off the bag underwater by twisting the opening, and remove it from the aquarium. Discard both the bag and the enclosed water. A tiny amount of the diluted water will escape into the aquarium; this is O.K. Also, to avoid damage, please remember never to touch the "fleshy" part of live coral when handling. Be patient - never rush the acclimation procedure. The total acclimation time for your new arrival should take no longer than one hour.